Today is the early entrant deadline for the 2018 NFL Draft, the last day in which draft-eligible juniors and redshirt sophomores can announce they will forgo future college eligibility to try their fortunes for a professional salary. The Big Ten will already see several prominent departures through early entry into the NFL Draft. Simmie Cobbs Jr. (Indiana) and DJ Moore (Maryland) were the first-team receivers for the All-Big Ten offense in 2017. Both declared for the NFL Draft. Saquon Barkley (Penn State), the best overall player in the conference, declared as well. Other prominent players, like Sam Hubbard (Ohio State), Josh Jackson (Iowa), and Denzel Ward (Ohio State), will leave as well. In this feature, we'll take stock of the talent that is set to return in 2018, highlighting the best returning player by each position. Departures notwithstanding, some of the best players in the country will still be in the Big Ten this season. Trace McSorley is clearly the best returning quarterback in the Big Ten for two reasons we'll belabor here. He is an exciting playmaker who thrived in the Fiesta Bowl win notwithstanding the departure of Penn State's brilliant offensive coordinator to the head-coaching gig at Mississippi State. McSorley was the consensus second team All-Big Ten quarterback last year behind J.T. Barrett, who just concluded a Big Ten career for the record books. Second, no one credibly accused the Big Ten of being a quarterback's league. The second best option here is likely Clayton Thorson (Northwestern), who had a 15-12 TD-INT ratio in 2017. Take your pick for the third best option after that: Michigan State's Brian Lewerke? Iowa's Nate Stanley? Elijah Sindelar (Purdue) might surprise some people this year too. Alex Hornibrook (Wisconsin), all 15 interceptions of him, is an option as well. McSorley is set to return as the consensus best quarterback in the conference, but he'll have issues in 2018. His best playmakers (Saquon Barkley, Mike Gesicki, DaeSean Hamilton) are all leaving. He'll have a new offensive coordinator as well. The Big Ten is as good of a running back league as bad it is as a quarterback's league. Three of the six running backs in the first through third teams for All-Big Ten offense return and the star attraction will certainly be Jonathan Taylor of Wisconsin. 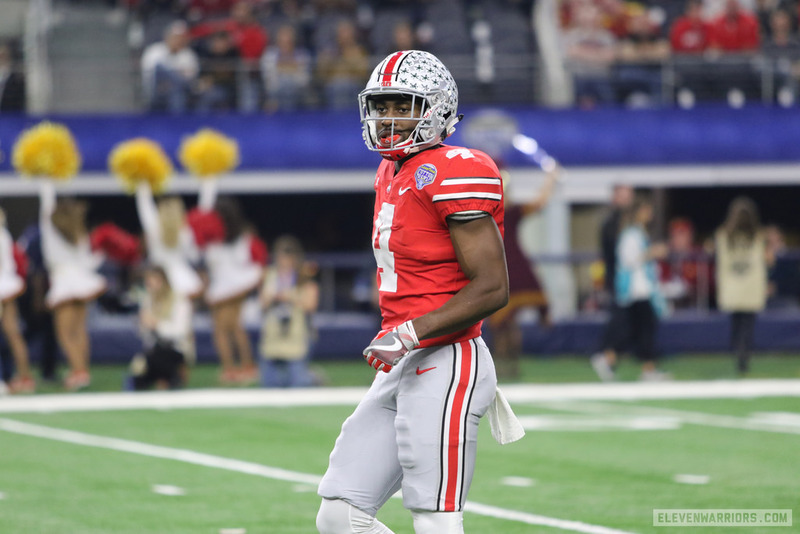 Taylor is the reason Ohio State's J.K. Dobbins didn't command more attention nationally and in the Big Ten for a brilliant true freshman season. Taylor was a freshman too, but outrushed Dobbins by 574 yards on the season. His 1,977 rushing yards in 2017 broke Adrian Peterson's mark for single-season rushing yards for a freshman. That's excellent company. There's nothing about Wisconsin that suggests Taylor won't have a sterling 2018 as well as a potential Heisman candidate. There's only some optimism from Ohio State fans that Dobbins could again compete for conference and national accolades alongside him. Ohio State fans will want to keep an eye on Nebraska's off-season. The 2017 Huskers were a bad football team with an error-prone quarterback that somehow still managed to be the No. 2 passing offense in the Big Ten (No. 27 nationally). The 2018 Huskers should be even better under a new coaching staff when they visit Ohio Stadium on Nov. 3. This hinges on the quality of Nebraska's receiver corp even as new coach Scott Frost will have to find a new quarterback. The top two returning wide receivers in the Big Ten—Stanley Morgan Jr. and JD Spielman—are both on Nebraska's roster. We'll highlight Morgan in this feature because 24% of Spielman's 830 receiving yards in 2017 came in garbage time against Ohio State as the Buckeyes were already routing the Huskers. Morgan, by contrast, led all Big Ten receivers in yards per game and touchdowns. He's going to be the focal point for opposing secondary coaches on Nebraska's roster. Keep an eye on Minnesota's Tyler Johnson, though. He's probably the best returning wide receiver in the Big Ten that's not on Nebraska's roster. The Big Ten was quietly stocked with great tight ends in 2017. However, the cream of the crop were seniors Troy Fumagalli (Wisconsin) and Mike Gesicki (Penn State). 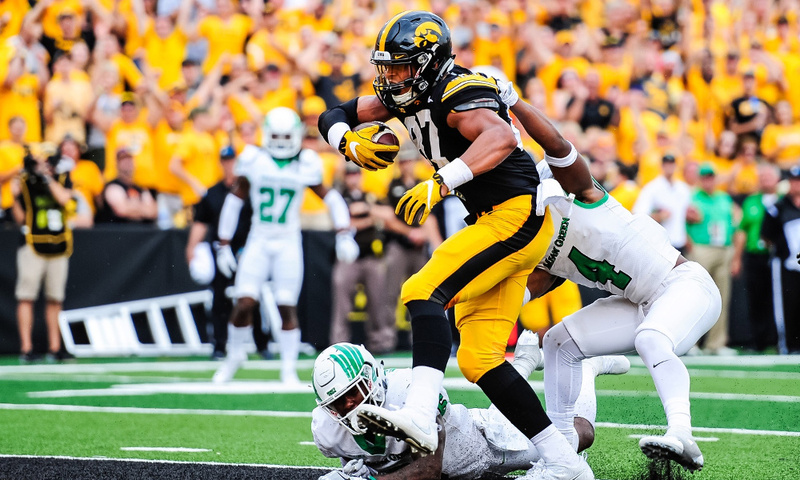 Iowa's Noah Fant, last year's third-team All-Big Ten tight end, is the best of the bunch that returns. Fant's season was overshadowed by Fumagalli and Gesicki but his 11 receiving touchdowns were most for any player in the Big Ten last year. They were also tied for most of any tight end in the country with Missouri's Albert Okwuegbunam. Fant will be the best returning tight end in 2018, but other options include true sophomore Louis Dorsey (Illinois) and Brycen Hopkins (Purdue). Hopkins should merit some scrutiny in 2018. Purdue likes to throw to its tight ends and the Boilermakers should be even better in 2018 in Jeff Brohm's second year. 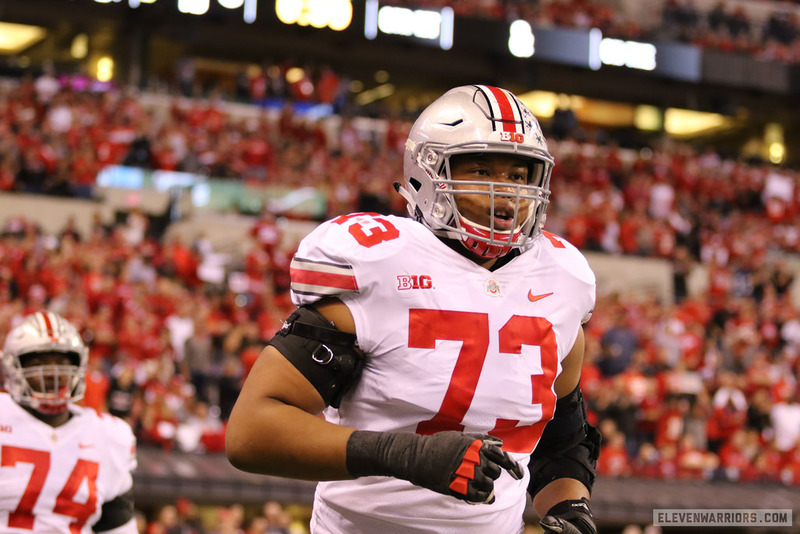 Billy Price won the Rimington Trophy for Ohio State and Brian Allen (Michigan State) was the consensus second-best center in the conference. Both were seniors in 2017. Biadasz, the third team All-Big Ten center, was a redshirt freshman who started all but one game at center. He also picked up Freshman All-American honors from ESPN, the Football Writers Association of America, and USA Today. Michael Jordan will be a three-year starter on Ohio State's offensive line in 2018. A Freshman All-American in 2016 and first-team All-Big Ten guard in 2017, Jordan will enter the 2018 season as one of the best offensive guards in the country. The intrigue here is whether Jordan slides to offensive tackle for Ohio State's 2018 offensive line. Jamarco Jones' replacement at offensive tackle is one of the more pressing questions for Ohio State's off-season. It's most likely that Jones' replacement will be a guard moving over, whether that's Jordan or Branden Bowen. Michael Jordan will return to Ohio State for a third year as starter. With that in mind, it's worth highlighting Wisconsin's Beau Benzschawel as arguably the best guard in the conference as well. Benzschawel was the other first-team All-Big Ten guard in 2017 and will return for a senior season in Madison. At the risk of slathering too much praise on Wisconsin's offensive line, it's arguably the best overall unit in the Big Ten and every starter returns in 2018. Deiter was the other first-team All-Big Ten tackle in 2018, joined by the departed Jamarco Jones. His odyssey to left tackle was unique; he had started 27 games at center and guard before making the transition. He made it seamlessly and should thrive in his second year at left tackle. Wisconsin's right tackle, David Edwards, should also thrive again in 2018 as a junior. The Big Ten should produce some scary defensive lines in 2018 despite not having a star interior defensive lineman that returns. Indeed, almost all of last year's three All-Big Ten defensive lines were defensive ends. As a result, we'll focus on the top two defensive linemen in the Big Ten that return in 2018. We'll start with Nick Bosa, nominally a strongside defensive end that featured at all positions in Ohio State's "rushmen" package. Ohio State's defensive line was the clear strength of the entire team in 2017. The unit will be hit with important departures but Nick Bosa will be why the unit will be one of the most feared in college football again in 2018. He supplanted senior Tyquan Lewis as the best player in the unit after leading the Buckeyes with 16 TFLs and 8.5 sacks. Bosa has the name recognition and will certainly be a first round pick in the 2019 NFL Draft but keep an eye on Northwestern's Joe Gaziano. A sophomore last year, Gaziano led the Big Ten in sacks with nine and finished tenth among all Big Ten defenders in tackles for loss. 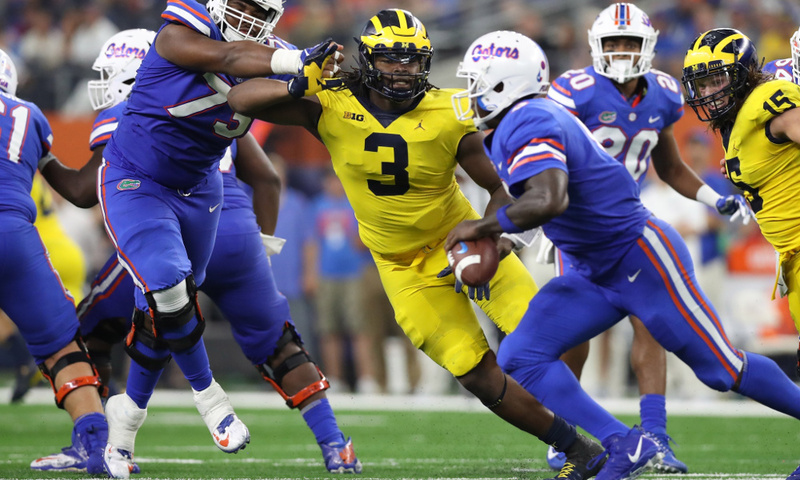 Rashan Gary is the kind of player to whom you point to highlight that true sophomores can be just as ready for the NFL as redshirt sophomores and juniors. Gary is an explosive defensive end for Michigan despite being the focal point for opposing offensive line coaches. Consider it a hot take as you like but his presence on the defensive line allowed Maurice Hurst, a fine player in his own right, to finish with better stats. Gary returns after a sophomore season in which he tallied 12 TFLs and six sacks. He, like Bosa, will be a certain first round pick in the 2019 NFL Draft. Michigan may have numerous problems but defense isn't one of them. Gary is a major reason why. It's worth repeating Michigan may have numerous problems but defense in 2018 won't be one of them. Bush, a sophomore in 2017 that led Michigan in tackles (100), should have an excellent junior campaign in 2018. We highlight Bush here as a nod to how well Michigan's defense performed despite its crummy offense. We could also afford important attention to T.J. Edwards (Wisconsin). Edwards is the other first-team All Big-Ten linebacker that will return in 2018. He finished No. 20 in the Big Ten in tackles with 81. All told, there is a glut of good linebackers in the Big Ten returning in 2018, including Joe Bachie (Michigan State), Thomas Barber (Minnesota), and Paddy Fischer (Northwestern). Almost every team in the conference, even Rutgers (Trevor Morris), has a quality linebacker returning in 2018. Lavert Hill should is almost certainly the best returning cornerback in the Big Ten. A two-year starter for Michigan, Hill will be a true junior for the best pass defense in the country. That alone should separate him from another option like Amani Oruwairye (Penn State). Further, the best cornerbacks in the Big Ten last year were all seniors (e.g. Penn State's Marcus Allen and Wisconsin's Derrick Tindal) or early entrants into the NFL Draft (e.g. Iowa's Josh Jackson and Ohio State's Denzel Ward). Hill is clearly the best cornerback in the Big Ten who will return in 2018. The Big Ten should have some good safeties in the conference this coming season but Fuller is poised for a breakout season that merits his inclusion as arguably the conference's best returning safety. Jordan Fuller had a good 2017 and should have a great 2018. Ohio State needed to replace almost the entire secondary from 2016 and Jordan Fuller is a major reason why the unit held steady through the course of the 2017 season. Fuller came into his own last year, supplanting senior Erick Smith as the other safety next to Damon Webb. He'll be the star attraction in Ohio State's secondary in 2018. Fuller will have some important competition this season for all-conference honors. D'Cota Dixon (Wisconsin) and Kyle Quiero (Northwestern) will return in 2018 as well.